Kirk Kerkorian was the most media-shy gaming executive I have covered in some 30-plus years following the casino industry. He was also, easily, the most influential. From the early 1960s until his death at age 98 in June 2015, the billionaire developer played a paramount role in shaping the Las Vegas Strip into a world class destination. He built, bought and sold some of the city’s most famous casinos. Three times he developed the world’s largest hotel-casino-resort from the ground up. Kirk Kerkorian at a Nevada gaming regulatory hearing with Terri Lanni (left) and Jim Murren (right). Kerkorian had dealings with every major gaming figure of his time. He was a rival to Howard Hughes, getting the final comeuppance when he bought the Desert Inn and Sands – the last two pieces of the hermitlike billionaire’s empire – for $167 million in 1987. A year later, he gave Sheldon Adelson his entry into the casino industry, selling the trade show tycoon the Sands for $110 million. He was partners with Jay Sarno in Caesars Palace, he bought Mirage Resorts from Steve Wynn, and led then-MGM-Mirage’s acquisition of Mandalay Resort Group. Those are just a few chapters in the Kerkorian story. William C. Rempel’s biography on Kerkorian – “The Gambler: How Penniless Dropout Kirk Kerkorian Became the Greatest Deal Maker in Capitalist History” – gives you a complete picture. 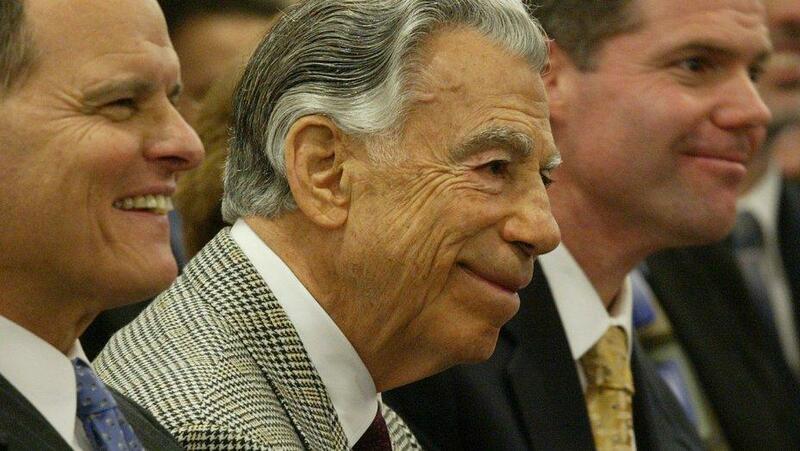 Kerkorian was more than a gaming industry titan. He was a movie studio mogul – buying and selling MGM Studios three times. Each sale turned a profit. Kerkorian created a charter airline service between Las Vegas and Los Angeles after World War II – personally ferrying Flamingo casino developer Bugsy Siegel on his last trip to the property two days before the gangster was murdered. Kerkorian owned stakes in several airlines, all sold for a profit. He twice set designs on the auto industry, acquiring large holdings in Chrysler and General Motors, again, selling the shares for profit. With color provided by Kerkorian’ gaming executives Alex Yemenidjian and Dan Wade, gaming and boxing insider Gene Kilroy, investment icon Michael Milken, longtime Kerkorian consigliere and close confidant Terry Christensen, and others, Kerkorian is painted as soft-spoken and understated. He was also a shrewd businessman who enjoyed the risk. He was far from shy or reclusive. English was a self-taught second language to his native Armenian. He had a fear of public speaking. But with close friends – including Hollywood luminary Cary Grant – Kerkorian carried on a thriving social life. Kerkorian gave away more than a billion dollars through his charitable Lincey Foundation, but he never wanted credit. In his ancestral homeland, Kerkorian is considered a saint for the financial support he provided after a deadly earthquake. But he insisted on no monuments to his generosity. Kerkorian’s aloofness with the media was misunderstood, friends said. “He was a very private guy who shunned the limelight, both in a business way and from a charitable standpoint,” Glaser told The Associated Press after Kerkorian’s death in 2015. Over the years, I had a few exchanges with Kerkorian. Once I spotted him at the MGM Grand in Las Vegas walking alone into the old Hollywood Brown Derby restaurant for dinner. Dressed casually in a white sport coat, he wasn’t flanked by security or aides. Customers had no idea he was the resort’s owner. In 1990, Kerkorian’s MGM Grand Corp. announced plans to build the $700 million MGM Grand Las Vegas. Kerkorian attended a news conference at the former Marina Hotel, which he was folding into the lavish new resort. His management team did the talking. Fifteen years later, Kerkorian attended a Gaming Control Board hearing for MGM’s $7.9 billion buyout of Mandalay. I approached Kerkorian on a break and he was gracious, answering a few questions. He said concerns about Las Vegas being overbuilt had been aired since the 1960s, but the city always prospered.